Here we are at he start of LSPR 2009. 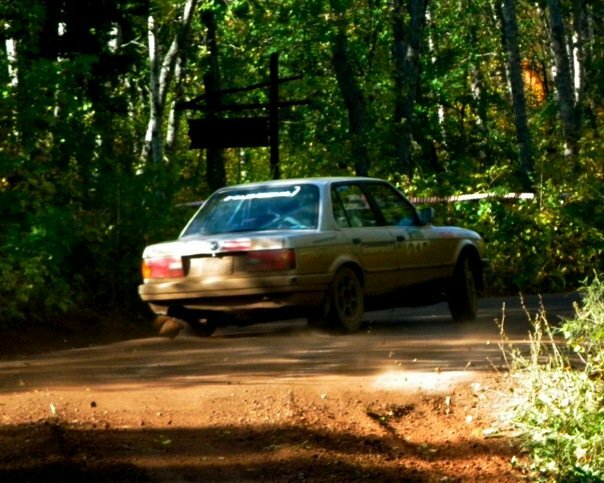 My third gravel rally. Should be a nice day for rallying. In hindsight, a deeper cut might have been better? So everything was going nicely until the final time control. The engine started making a ton of noise and things started banging on the firewall like there was an animal in there. Turns out our engine broke free from its mounts and was banging around in the engine bay. Eventually it hit the coil packs and started a nice electrical melt down, black death smoke and all. I managed to get the battery undone before it ruined the ECU, but the car was full of that awful black electrical smoke and it was 2:30 in the morning and we were an hour from civilization. And it was raining/ starting to snow. And we had to start tomorrow at like 9am. We were done. But I woke up at 6am and went out to the parking lot were we had our car flat towed by a random pickup truck saving us and hour waiting for our team van. I kept trying to make new mounts, to replace what had broken. I even managed a hammer as the rubber mount supporting the engine but I actually torn steel of the subframe where the original mount used to sit so it was mess. I was nearly done and was about to just compress the engine down on the mallet to hold it even better when I realized I should be able to suspend the motor in the engine bay by the same means! 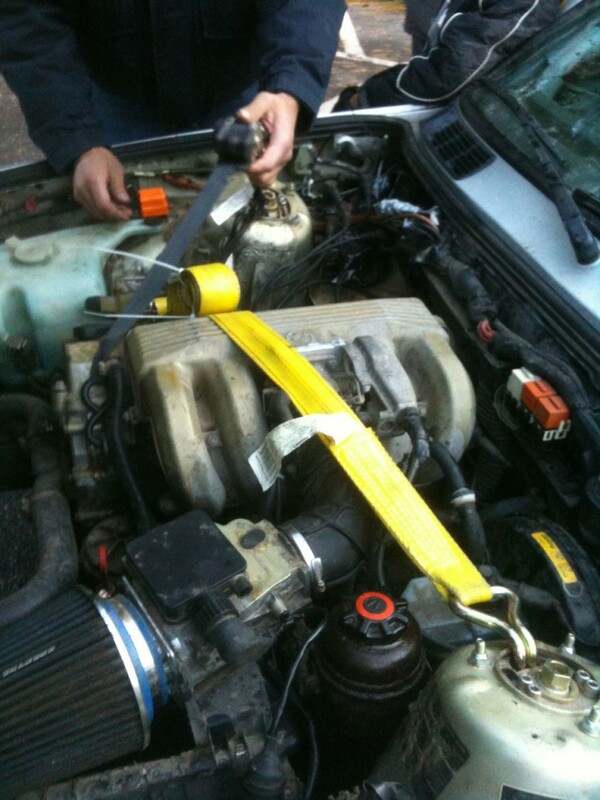 I criss-crossed the straps and ratcheted away raising the motor in the engine bay! At the first service we added these larger straps and another one that went around the front of the engine to keep it from going forward under breaking and pressed on. The motor was actually pretty secure and later we added a click or two to the straps and the things got way better. There were some moments were I could feel the trans swinging in the car and my shifter is mounted to the chassis so it was tough shifting for a bit as I would wait for everything to align itself! But we stayed after it and finished in 1st place after some of the faster 2wd cars crashed or broke beyond repair. Thanks to Dillon Van Way and his team for loaning us the giant yellow strap which had the right hooks to fit through shock tower!